Tableau outstanding and remarkable features and services are what make it the perfect tool for improving profitability and simplifies your works. Don't let your competitors get ahead of you. The real estate industry thrives on data. Your ability to get insight from it can set you apart. Do detailed site analysis using demographic data and Tableau's built-in mapping capabilities. Analyze and share market trends Understand market trends across metro areas. 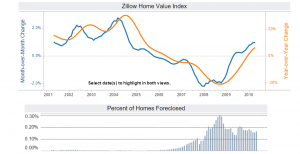 Here the change in home values (as estimated by Zillow.com) and the trend in foreclosures for a number of metro areas are presented together. This dashboard lets you see changes in home prices in the context of foreclosures in the area, which is clearly an important influence on the price. In the Washington D.C. area, home prices dropped right along with a dramatic rise in foreclosures, but are now rebounding. You can also filter to different metro areas and see that, for example, the Boston area did much better than the Las Vegas area. Provide customized market reports to clients and employees To understand the market you need information on price, supply, sales volume and more. You need to slice that information in many ways to deliver the right answers to the right people, whether they are your clients or your employees in the field. With Tableau Desktop you can show overall market trends and with a click, drill down into the data or filter to a new area. Publish your view to Tableau Server, and you can put it on a secure portal or embed it on your website to help you attract new clients. Build rich, interactive market views in a short time and with no specialized programming, while maintaining control over the level of access each client receives. In this monthly report on the Seattle Metro area, you can see the relative size of the local markets in the map view on the left. Clicking on the view highlights the supply and price trend information for that county. Linking perspectives across views in this way is a powerful way to understand market trends. Make hyper-local dashboards to cater to your audience It’s a cliché: all real estate is local. But it is. And you need to be able to assess market trends neighborhood-by-neighborhood; even block-by-block. With Tableau, you can drill all the way down to specific properties, define your own regions for analysis, and sort and filter by multiple characteristics of the properties. 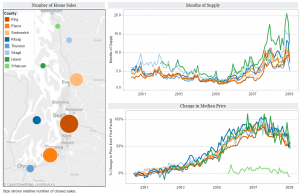 Whether you’re looking at 3-bedroom homes in the Boston area, condos in Manhattan, or commercial property in San Francisco, Tableau gives you the tools to understand the trends right at ground level. Standard real estate reports don’t give you the richness and level of detail that you need to really understand a local market. 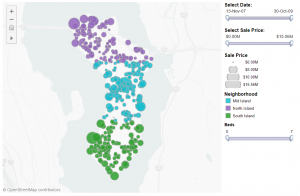 Here we’re looking at a market report created in Tableau that shows all home sales colored by custom-defined area (North, Mid and South Island) and sized by the price. You can quickly see outliers, like the $16 million sale in Mid Island, and trends, like the cluster of lower-priced sales in North Island that are probably condos. You can hover over each sale to get more details. This type of highly customized, visual, market-specific report makes you stand out to clients and provides a level of insight that your competitors don’t have. 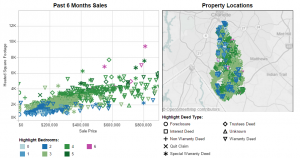 Do rich, deep and highly localized valuation analyses If you’re putting money to work in real estate, you know that your return will depend on many factors. You’ve got to make the right investment at the right price. But how do you balance all the variables: location, amenities, square footage, and so on? What you need is to be able to filter down to exactly the type of property you’re considering to be able to price it correctly. Customize your analysis by deed type, number of bedrooms or area to find the perfect comparables to help you value potential investments. This mini-application was created with no custom programming—just drag and drop.